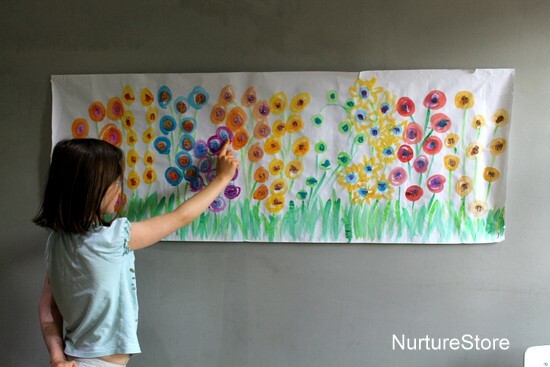 “Have nothing in your house that you do not know to be useful, or believe to be beautiful.” So said William Morris, and this flower number line scores full marks, being a a great way for children to learn about number patterns and relationships – and also looking absolutely lovely! Here’s how to make one, and how to play some number line games. A number line is an essential piece of maths kit and helps children visualise and interpret number patterns and relationships. 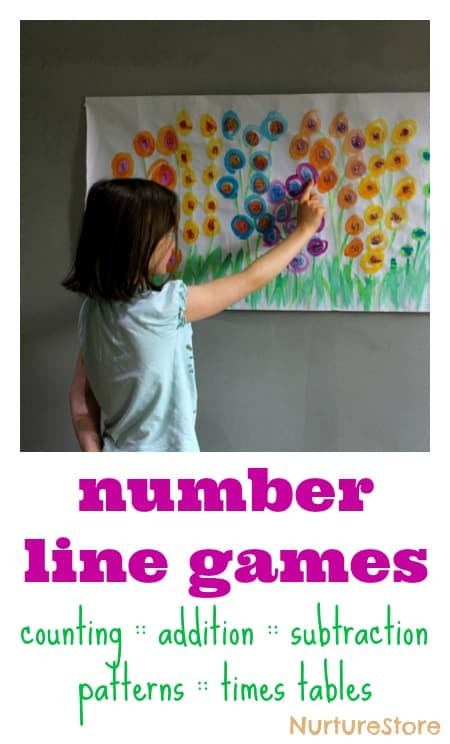 They’re very easy to make and you can use them for lots of different number line games. To make one, start by deciding how many numbers you want to cover on your line. For toddlers you might keep things simple with the numbers one, two and three. For preschoolers you might have a line from one to ten, and focus on the patterns within this range. For my school-age daughter we’re making one that goes from one to 100. In the past we’ve used a piece of string as a washing line and pegged on numbered ducks, leaves or ladybirds. For our flower number line we’re using a big roll of paper. 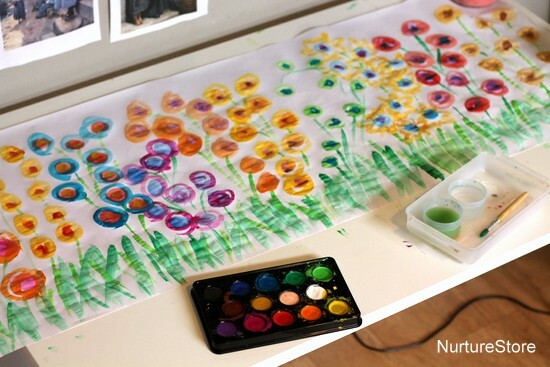 We used watercolour paints to make a beautiful flower garden across the page, painting sets of flowers in different colours to make groups of ten. Once the paint was dry, I used a permanent marker to write a number on each flower. Each colour set contains a set of ten numbers (so the 20s are all blue, the 30s all pink) but the numbers within the sets follow a slightly irregular line. We’re studying bees at the moment and wanted the numbers to flow along the flowers in the same way a bee might fly around. There are many variations you can play with a number line, to suit children of different ages. 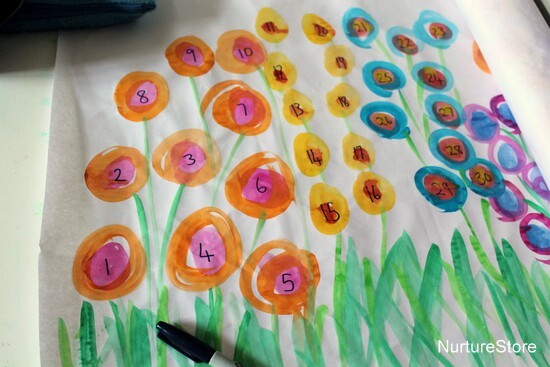 Very young children might simply point to each flower in turn and count out the numbers. If your child loves counting toys, or plates at mealtimes, you can find the matching number on the line to help then learn the names and form of each digit. You can ask your child to point to ‘one more than’ or ‘one less than’ a particular number. Have a treasure hunt and see if you can find one car to place on the number one, two dolls to place on the number two, and so on. You could work out how many cups you need for all the people at snack time, and see if you can find the matching number on your line. You could see if each child can find the number that matches their age. You can use the number line to help you work out sums : counting up or down the line to answer addition or subtraction questions. The number line gives children a great visual reference to help them understand the meaning behind abstract maths questions. As we have done here, you can extend the number line to 100 and use it as an aid for children who are beginning to add and subtract two digit numbers. You can look out for patterns. Perhaps you can place a wooden block on all the odd numbers, or a toy on all the numbers that end in zero. This is a great way to support visual learning. You can use the number line as a board game. Have each player start a toy character on number one. Take turns to roll a die. Whatever number you land on has to be added to the number flower you are on. So, start on one, roll a six, and you get to jump to seven. Keep taking turns to roll, add and move, until every player makes it to 100. Or start at 100 and go backwards to practise subtraction. Even with slightly older children, this kind of ‘rapid fire’ mental maths helps them build confidence and speed.